What is Italian cuisine? There are around 20 regions in Italy, so having a singular notion of Italian food would hardly do justice to this country's amazing culinary heritage. Spaghetti and meatballs are apparently as authentically Italian as fortune cookies are to Chinese food. As we learned, the Italians like their balls served separately. It is more important that the sauce matches the pasta. The lineage on regional Italian cuisine is an historical and geographical journey full of influences from France and Spain, to Moorish traditions, to the legacy of the Venetians and ancient Rome. It also celebrates its bounty of olives and grapes, as well as the fruits of the sea that would typify mediterranean fare similar to Greece. For this gastronomic adventure we focused on Pugliese (no, not Dina) food from Massimo Bruno's home town of Bari in Puglia, located in the heel of southern Italy. The cooking style in Puglia is often referred to as Cucina Povera, literally cooking poor. It places more emphasis on traditional methods of cooking and living off the land that came about after the first world war. Something-from-nothing is an art of preparing a rich spread of dishes from only a few fresh ingredients. The egg balls were a crowd favourite. Made primarily with egg and bread crumbs, they make a pretty good meatball replacement for vegetarians. I also really liked the fior de latte mozarella. It was very soft and moist, with a mild silky feel on the tongue, brought to life by the clean and fresh taste of basil oil. The bitterness of the rapini in one of the pasta dishes was excellently complemented by the salty full flavour of anchovie oil and bits or crunchy browned garlic. We also loved the pappardelle's milky taste and the lovely texture of its fava puree. 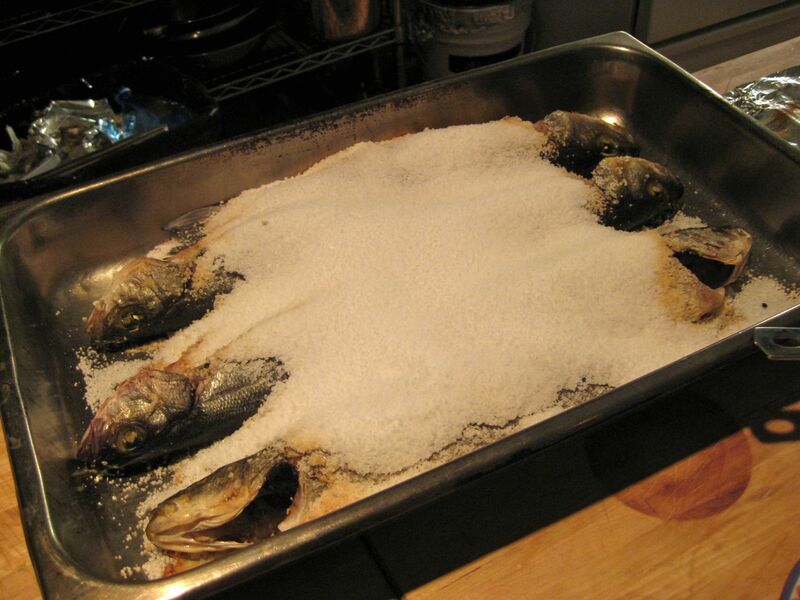 Baking the seabass under a bed of salt left it fabulously moist. With no seasoning but a mild vinaigrette, the unadulterated essence of the fish was deliciously preserved. Dessert was also excellent. Ricotta makes for a milder and fluffier cheesecake, served with a candied fig, what more can I say?